﻿ Self cleaning hot water boiler in public swimming pool. A hot water boiler is used to heat up drinking water and also store it. Often they are directly connected to the central heating. These boilers tend to have problems with limescale, especially when the temperature is high. Additionally these boilers start to corrode after some years. That’s the reason why new boilers often are made from stainless steel. If Merus Rings are installed at the water inlet, limescale and rust is solved in the water and can’t settle anymore. It will be flushed out with the water. There is one factor which can reduce the effect of the water treatment. This is the electrical field which is emitted by the heating spiral. If this field is too strong not the whole incrustation can be solved but nevertheless the new formation of deposits is reduced significantly. Where we are currently working in the „Südbad“ – the public swimming pool with sauna – are the hot water boilers. The storage capacity of hot water in the boilers is rather high, in order to meet requirements of peak consumption times. All together there are 4 boilers each with a capacity of 3.000 liters as they have to feed more then 30 showers. The temperature in the boiler has to be at least 60°C, to avoid a possible growth of legionella in the water system. In the daytime there are fewer customers in the pool using the showers. Then there is only a low flow rate in the boiler. As a result the heat bundle has a high tendency of furring up. The raw water is not treated chemically for cost reasons. The boilers need to be cleaned regularly which means disassembling the heat bundle and removing the deposits. This has to be done more often than in industrial heat exchangers due to the low flow rate. 4 hot water boilers (each with a capacity of 3000L) are all in one room, very close to each other. So we have installed only one 3″ Merus Ring at the common feed pipe for all hot water boilers. We decided to check the performance during the regular down times when the service is done. When the heating bundles were disassembled there were these pictures taken. 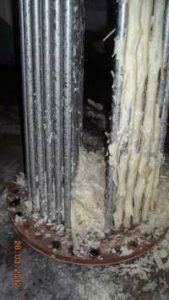 We can see that there is only a soft layer of limescale on the heating bundle and only in the upper part of the heat exchanger. The few chunks of limescale couldn’t block the pipes anymore. 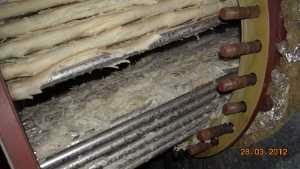 They occur while the heat exchanger is active and settle when it is disassembled. The deposits are so soft, they will just fall off the heating bundle when it is put on the floor. This means that cleaning is far easier and cheaper. Some water is sufficient. Installing one 3“ Merus Ring is a small investment compared to the costs caused by long downtime due to cleaning. Therefore the investment pays off in short time. As the heating bundles work more efficiently without incrustations energy for the heating is saved. These savings can only be estimated roughly as there is not enough data from the past. The customer and we assume that the savings are substantial as even one millimeter of limescale at the surface of the heating bundle reduces the heat transfer by 14%.